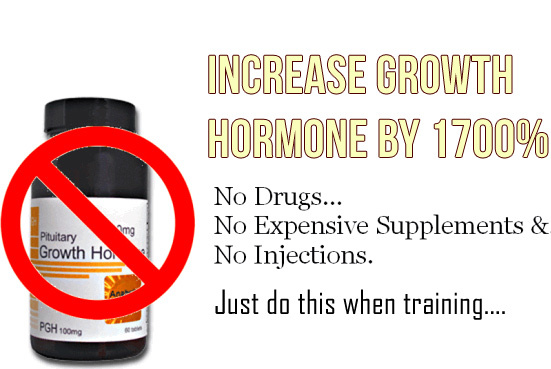 You’re about to discover how to jack up your growth hormone levels by a pretty huge amount – 1700% to be exact. And you won’t need to buy anything! Just use a certain “cadence” when lifting. Increased growth hormone will stimulate a release in IGF-1 (insulin-like growth factor) helping you to grow faster...and lose fat much faster. They measured growth hormone levels for half an hour after the training session was over. At around the 15-minute mark, growth hormone levels peaked for both groups, but were a massive 1700% higher in the slower negative group – the group that took 3 seconds to lower (technically called the ‘eccentric’ part of the rep). Those of you using my free THT training routine, know that I highly encourage you to CONTROL the negative on every single rep…of every single set…on every single exercise. I say this because we have known for some time that this approach recruits more muscle fibers. But this new research really hammers the point home! So…stop “dropping” the weights after you’ve lifted them. P.S. 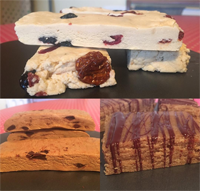 Want treats like these “Buff Bars”, Protein Cookie Dough, “Buff Cookies”, Protein Bread…and many more to “cheat clean” and fuel muscle growth in the tastiest way possible? I eat this stuff all time. 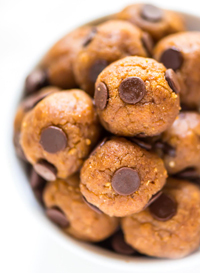 See my Buff Baking anabolic cookbook. NOTE: You’ll also want to jack up and maximize levels of testosterone naturally. So I put together a short guide that reveals 8 ways to optimize test levels so that you can have more lean muscle, increased strength, increased energy levels and less body fat. Or consider letting me do the hard work and design cutting/bulking meal plans and workouts for you at my coaching page. Reference:  “Acute Effects of Movement Velocity on Blood Lactate and Growth Hormone Responses after Eccentric Bench Press Exercise in Resistance-Trained Men.” Biol Sport. 2014 Dec; 31(4): 289–294. I’m guilty on this on some lifts. It’s a bad habit that has been hard to break. Bicep curls as an example. I’m not controlling the weight on the negative. Need to pay more attention to that! I take it that with a three second negative the weight must be substantially reduced to be able to perform the exercise with proper form. Chris the weight isn’t reduced but the work/intensity is increased that way. @Chris. With the same weight, you may hit a rep or 2 less, but the time-under-load would be the same. In my THT book, I say it’s all about CONTROLLING the negative. I don’t think 3 seconds is necessary. Usually a 1 sec lifting, 2 secs lowering works wonders. The key to this is really controlling the negative and really feeling the muscle throughout the rep.